We are one of the prime buffalo horns manufacturers and exporters, in various range such as full buffalo horns, polished buffalo horn , buffalo horn pairs, buffalo horn tips, buffalo horn core, buffalo horns round tips, buffalo horns carved tips. Indian water buffalo horns are widely used in making strong and durable optical frames in almost all colors. 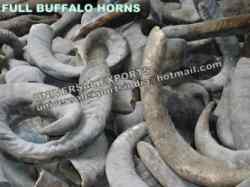 Our finished buffalo horns are highly demanded by our worldwide customers due to its good quality and fine finishing. We provide all kind of horns including cow horns, sheep horns, goat horns, ram horns, animal horns, Indian water buffalo horns, water buffalo horns at very reasonable price. We invite customers of raw buffalo horns and finished buffalo horn from worldwide market Australia, Austria, Belarus, Belgium, Britain, Bulgaria, China, Germany, Japan,Netherlands, New Zealand, Polans, Russia, Singapore, Spain, Sweden, Switzerland, United Kingdom, Vietnam and worldwide. Universal Exports is a prime manufacturers of buffalo horn roll in India. Our horn rolls are widely used in making knife handles, stamp handles etc. Our finished horn rolls are also used to make knife horn rolls, stamp roll, seal roll, seal stick and also known as horn cylinder. The range of buffalo horn roll come in wide range of colors including brown, green, Grey, black with stripes. Our Buffalo Horn Roll is widely used to make handcrafted handles in various items. Our customers appreciate us for our ability to deliver quality products on time and we feel immense pleasure to be considered as leading buffalo horn roll manufacturers exporters in India. We would like to export horn roll to USA, UK, Canada, Australia, Japan, Germany, Poland, New Zealand, South Africa, China etc.